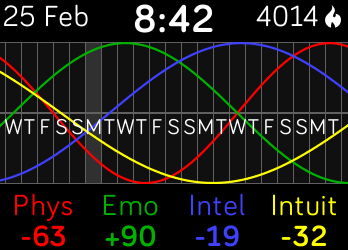 See your current biorhythm chart and stats. This product is available as a clockface or an app. 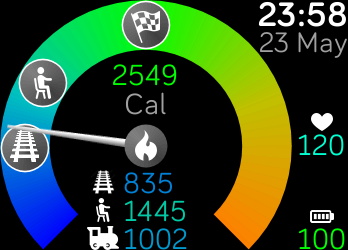 On Track shows a gauge and statistics that let you see whether you're on track to meet your daily goals, considering the current time of day. 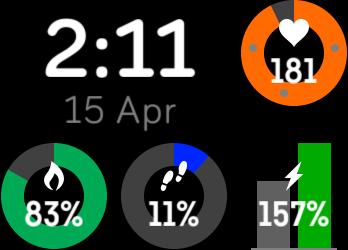 In addition to time and date, this clockface provides gauges for current heart rate and daily energy, distance and active minute totals. If current values are below maximum heart rate or exercise targets, the gauges are pie charts; beyond 100%, they switch to bar charts showing target vs. actual. Turn your watch into a miniature picture gallery or image carousel! 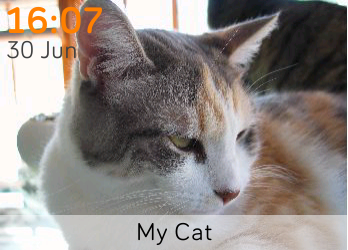 You can have up to 24 images of your family, friends, pets, ID cards (etc) just a twist of the wrist away.